We need to find ways of how to save energy at home and at work, and in everything we do. Saving energy is critical these days, especially as natural resources used in the production of energy become depleted. Energy saving also becomes top of mind when in an economic recession. But if you are concerned for the environment at all, then a high power bill is probably not the only thing you are worrying about when you think of saving energy. Currently we are burning through our natural resources so quickly that we are actually running out. Yes, there have been conventions dedicated to saving our resources, as well as the United Nations Commission on Sustainable development, but the UN can lecture as much as it wants. At the end of the day, the fate of the planet depends on each and every one of us. We all need to do our bit to go green. Refer to a list of renewable energy source ideas and see what you can implement in your home life and work environment. The best place to start is at home. We must also carry through our energy saving initiatives to the workplace. Energy saving needs to become a way of life in everything we do. Make a start with energy saving posters to create awareness and to act as prompts at light switches and high energy using equipments. Here are a few goal setting suggestions that should help you learn how to save energy at home. The first thing you need to do is flick the switch and turn things off. This could include your computer monitor when it is not in use, your television, heaters, air conditioners, unplug cell phone chargers and anything that is not being used. Get a timer for your geyser, which is one of the biggest users of power in the home. Even though these might be things you use on a regular basis, you should still do your best to make sure they are turned off when not needed. Recycling is another huge part of saving energy at home. If you have any material that can be recycled, then you should set it aside. You can assign bins to different materials. You could have one set aside for plastic, one for cardboard, and one for cans. When you set these out for the trash pickup, they will be separated accordingly, and send to a recycling facility. This will not save energy in your house, but it will go a long way towards saving energy for the world by reducing the amount of energy used in having to manufacture those items from scratch. If you truly want to save energy at home, then you could install a solar power system to ward off your dependence on the local power grid. This way you will be putting energy into your house and into the city power grid. You might even find that the city will pay YOU for the power that you are giving them. 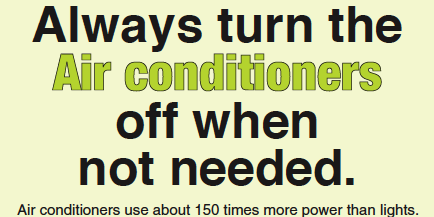 Make energy saving posters to put up as reminders to turn items off. This will help you and your family to remember to switch off. These are a few ways of how to save energy at home. By doing even one of these energy saving methods you can make a start and start building new habits. The first step begins with you and every little bit makes a difference. The more consumers find ways of how to save energy at home by, for example, switching off non-essential appliances, the fewer power outages there will be. Switch non essential appliances off when not being used.